What are the critics saying about Mirror’s Edge Catalyst? It’s been a long time coming for a Mirror’s Edge sequel. The first game was a revelation back in 2008, offering polished parkour mechanics, a signature minimalistic visual style and wonderful setpieces. Eight years later, we finally have Mirror’s Edge Catalyst on PS4, PC and Xbox One, breaking free from the original’s corridors and leaping into an open-world environment. So, what do the critics think? Ars Technica’s Kyle Orland felt that, while the parkour mechanics still stood out, the open-world design was a hindrance. “There is definitely fun to be had simply running through Mirror’s Edge Catalyst’s beautiful cityscape like some sort of all-knowing speedster god. It’s all the stuff that surrounds that simple, joyful running that ranges anywhere from annoying to downright frustrating. In the end, combining a game about running as fast as possible with one about exploring a vast open world ends up being a pretty awkward pairing,” he said. Orland added that the game looked beautiful and there are plenty of things to do, but exploration was a trial-and-error affair and enemy AI was left wanting. Eurogamer’s Martin Robinson also criticised the open-world environment, but praised the movement and accompanying sense of immersion. “The sense of motion is, once more, exquisite, told by the weighty sway of the camera as you reach the peak of your sprint, and the glorious sound design as the soles of Faith’s feet tread softly on concrete, the whistle of wind in her ears as she falls through the air and the palm-stinging snap of gravel as she lands. Movement, in short, is a treat, but it’s all undercut by the problem of there being nowhere interesting to move to,” Robinson explained. He also criticised “half-hearted” open-world tropes, such as fast-travel mechanics, a wanted system and “mindless, meaningless collectibles” scattered around the city. “What a shame, then, that it’s an all-too-familiar tale for this sequel. 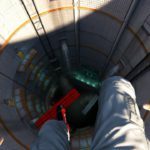 The original Mirror’s Edge was always a great idea somewhat obscured – how frustrating to find Catalyst polishes the premise only to find itself burdened with a new set of shackles. It’s a slight reward for those who’ve kept Faith, but this is a sequel that’s too often lacking grace,” Robinson concludes. Arthur Gies of Polygon gave the game 8/10, saying the open-world shift was “a pretty good space to allow the series to grow”, adding that the sense of scale was much bigger than the original. 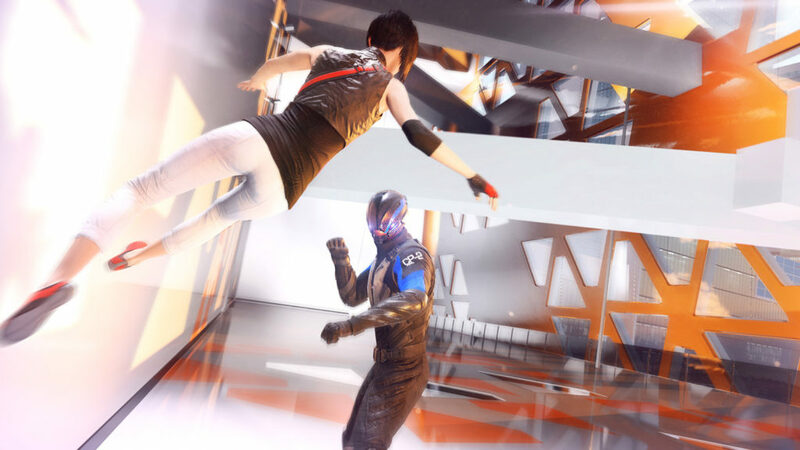 “This allows for a lot more of what made Mirror’s Edge great in the first place, though it’s not without some strange concessions to generic, open-world game design ideas that trip things up here and there. For example, some incredibly important basic parkour abilities are locked behind an upgrade tree – namely, the 180-degree turn, an ability that is literally required to complete the game, as well as the double wall-run, which, while not required, is profoundly helpful,” Gies said. Polygon’s review also critcised the emphasis on combat, saying it was the game’s “crutch when it can’t think of anything else to do”. Gies said that once the story is done, there’s plenty to do, but many players will be happy to merely run around in the city, having never finished the game. IGN’s Ryan MccAffrey gave the game 6.8/10, saying that the movement systems and user-made time trials were the only real strong points. “Catalyst is hardly a bad game, thanks to the strength of its movement systems, but everything else about it is so uninspiring that I get sad when I recall my initial reaction to its announcement,” the reviewer noted. Otherwise, MccAffrey noted the hit-and-miss combat and added that collectibles often forced you to stop and look around.